Physical characteristics: Southern logrunners, also known as spine-tailed logrunners, are 7.3 to 8.3 inches (18.5 to 21 centimeters) long. Males weigh 2.08 to 2.4 ounces (58 to 70 grams), and females weigh 1.6 to 2.08 ounces (46 to 58 grams). This species has tan and grey feathers with a black stripe on its wings. 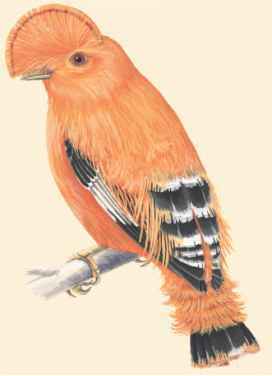 The female has an orange throat, while the throat of the male is white. Geographic range: These birds live in a narrow strip forest on the eastern coast of Australia from New South Wales in the north to Queensland in the south. Habitat: Southern logrunners thrive in the heavy vegetation on the rainforest or wet sclero-phyll forest floor. They will range into nearby underbrush if it is sufficiently dense. Diet: Southern logrunners eat insects, worms, and other invertebrates, animals without backbones, that they find in the soil. Behavior and reproduction: Southern logrunners use their tails to help them find food. Spreading their tails, they anchor the sharp tips into the ground. This allows them to rake their feet through the litter on the forest floor, and scratch the ground to uncover larvae and insects. They can pivot on their tails, clearing an 8-inch (20-centimeter) circle. Yellow-throated scrubwrens and eastern whipbirds often follow behind logrunners and chowchillas and pick up insects and grubs the other birds ignored. Southern logrunners stay within their territory throughout the year. They mate for life and will form small family groupings within their territory. The bird usually breeds from May to August, but have been observed mating as early as April and as late as October, producing one or two broods, groups of offspring hatched at the same time. Only the female builds the nest, which is a dome-shaped structure, made of sticks and grasses, built against a tree trunk or bush low to the ground. The entrance is placed on the side and a flap of moss covers the entryway, protecting the interior from rain. Only two white eggs are laid by the female. The female incubates the eggs for twenty-one to twenty-five days. When hatched, the young birds remain in the nest for sixteen to eighteen days, fed by their parents. Although shy, they will ignore humans. But when startled or in danger, their piercing "keek" call can be heard for some distance. Their normal song is an equally loud series of "weet" sounds. Southern logrunners and people: There is no known significance between southern logrunners and people. Higgins, P. J., and J. M. Peter, eds. Handbook of Australian New Zealand and Antarctic Birds: Pardalotes to Shrike-thrushes. Melbourne: Oxford University Press, 2003. Robbins, Michael. Birds: Fandex Family Field Guides. New York: Workman Publishing Company, 1998. 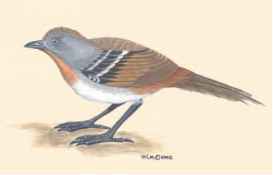 Schodde, R. Directory of Australian Birds: Passerines. Collingwood, Australia: CSIRO Publishing, 1999. Simpson, K., and N. Day. A Field Guide to the Birds of Australia. Ringwood, Australia: Penguin Books Australia Ltd., 1996. Weidensaul, Scott. Birds: National Audubon Society First Field Guides. New York: Scholastic Trade, 1998.